As predicted, now closed and boarded up. Grew up in this aera and used the 'Little' George a lot over the years. Visited Sunday for the last time as it's closing on Jan 12th to be flats/shop, shame on you shepard & neame. A decent pub with friendly locals/landlady and good beer. Went there for the first time in 12 years a couple of weekends ago � what a little gem! Good Shepherd Neame ales, the most amazingly clean toilets, live entertainment� and then the bombshell came, after talking with the locals: This pub will close in January 2010 if a buyer isn�t found. 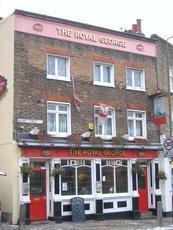 Me and my wife have fond memories of the George and were thrilled to see it in such a good state. I can honestly say I felt a bit sick when I heard it might close, and one of the locals we spoke to was a bit choked up when he told us.